Game Analysis Kingdom Hearts III is an upcoming action role-playing game for the Sony Playstation 4. After years of rumors and speculation, the game was confirmed to be in development during E3 2013. After 14 years we can finally say it. It’s here. Kingdom Hearts 3 is one of the most anticipated games in arguably our generation so far. Ever since number two came out, I’ve graduated school, joined the military, fell in love, traveled the world, and have a professional career. A lot has happened in my life since Sora returned to Destiny Islands to be reunited with Kairi and the rest of his friends. But the story couldn’t end there. There were too many plot holes not filled, too many loose ends not tied, and evil was still after Kingdom Hearts. The story was not over. So lets start this experience up. 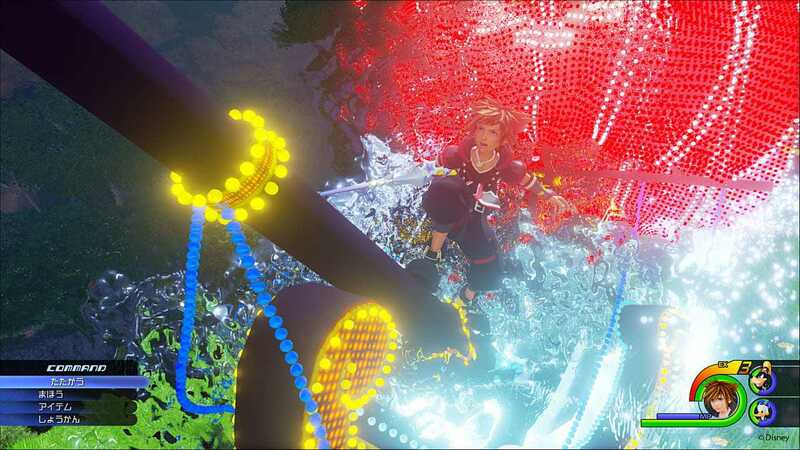 EYECANDY – The visuals in Kingdom Hearts 3 is a definite highlight of the game. The whole entire game looks like a fully rendered Disney movie and at times, the cinematography is so great that you will be watching a movie at times. Just straight up. The video direction, art department, and animation studios went all out and spared no expense. Whether you’re battling toys with Woody and Buzz, Riding the tram at Twilight Town, or sailing at The Caribbean, no detail was missed or looked over and not at any one point with the visual experience that Square Enix delivers disappoints. SOUNDDESIGN – So there’s not a lot going on in the sound department here. Which isn’t necessarily a bad thing. It just means there wasn’t anything innovating or new, but they more played it safe. BUT this was also where they cut some budgeting. The biggest drawback is its voice actors. The voice acting in Kingdom Hearts 3 is so hit or miss it’s not even funny. Some of the actors are the their counterpart from the movies, others are sound-alikes and do a decent job, and some are just terrible. Bland delivery, no emotion, no character, just straight up bad. And even then, the direction of the voice acting and the writing was so cringey at times I was playing it by myself and felt embarrassed. Now the bright side though would be the music. It was great. The composer did a phenomenal job in keeping the world songs familiar, but at the same time putting the Kingdom Hearts spin on it. So if we were to look at the aspects of the sound in this game it would go like this: Soundtrack 10/10, sound design, not great but overall not bad, voice acting? Jesus. GAMEPLAY – The first thing you’ll feel on your controller is the pace of the game. The maps are huge, Sora is almost constantly sprinting, sliding, dashing, and jumping from enemy to enemy getting knocked back, recovering, and getting back into the action. Which is a good thing but the game made it an overwhelming system. Especially with it’s new attractions combat mechanic. Which are quite literally Disneyland rides with LEDs all over them. There’s the teacups, carousel, the Buzz blaster(? ), pirate ship, pretty much all the rides that are famous at the happiest place on earth. Honestly, they’re pretty dumb in my opinion. And that was partly due to the fact that easily ten hours into the game it’s still giving me tutorials on other new game features that they shoved in. Which on one side is a good thing because all these details really do tailor to the whole “play as you want” approach but on the other end it feels wrong because these aren’t major abilities, power ups, or upgrades. Like typically in a game when a major mechanic is introduced I think it’s more than appropriate to have a tutorial or “practice” section in the game where you can get used to that mechanic. Or if it’s a new item or weapon so you build that situational familiarity within the game. Examples noted like God of War or Zelda. The main issue at hand is you forget all of the abilities available to you and you’re unsure of what to use when, and which mechanic would work best on which enemy or situation. When you’re not fighting the heartless, there’s very little the game offers to have you explore or revisit each world. You’ll waste minutes on top of hours aimlessly searching for hidden chests, items, or any other little goodies that you might think will be lying around. Which actually I’ll give them the balance of having good level design because while the game is open, it’s still linear. 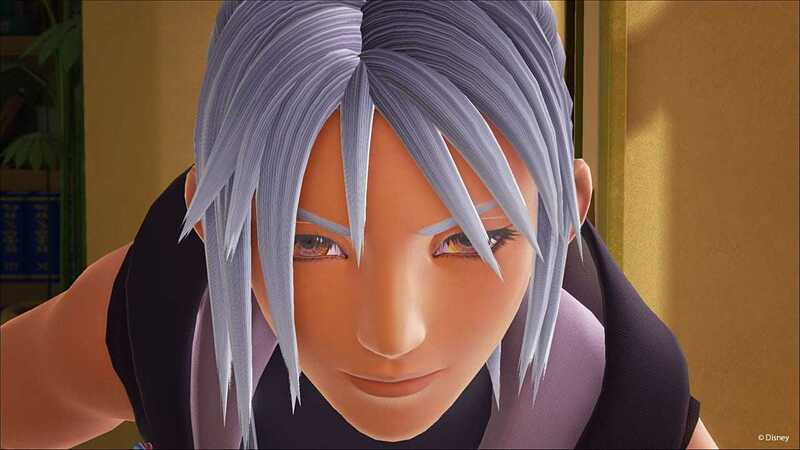 Meaning that Kingdom Hearts 3 does a really good job of leading you where they want you to go, and if there is anything “hidden” to be found, they’ll give it to you. There will be a character cue, or a not-so-hidden- path, or something of that nature. The game is extremely assist heavy, and there’s almost no difficulty to the game. I was going into worlds almost ten levels above me, no potions, unequipped, and decimating boss battles without any issues. Out of the entire game I only died around seven times, most of it being at the end where there is a noticeable difficulty spike. Which was what made the game enjoyable because it was finally a challenge and I was no longer bored with the game. But this wasn’t the only aspect of inconsistency in the game. 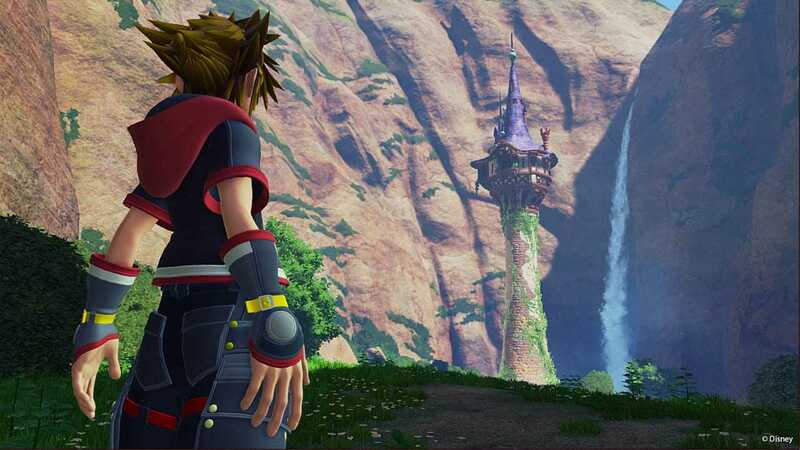 STORY – The narrative in Kingdom Hearts 3 is the lowest point and the highlight of this game. As convoluted the story has become with its almost Game of Thrones style writing and character weaving, number three did a great job to keep you up to speed at the beginning but didn’t do a great job as to figuring out how to lead you to the end of the game. You aimlessly travel from world to world for quite literally no reason, er rather the reason of “following your heart”, but even if that was the driving factor to progress the story, when you go to these other worlds, once again there’s no reason. Organization XIII might show up every now and again, but rarely do they actually have a motive for invading these worlds. It didn’t have that flow and sense of adventure the last two had. You quite literally just jump from one world to the next for fan service and to get the world specific keyblade. At one point Org13 reveal that they have plans which is why they’re at that world, i.e. experimenting on others for their endgame plan, and that aspect could’ve easily been a forwarding factor in the story. And it requires minimal writing so it could’ve been easily implemented. I would go into it more, but spoilers would follow. The only good part about the game is about the last five hours where the actual story sits. It’s the only moment in the game where the pacing picks up, it gains momentum, you want to keep playing it, and then it ends. And even then, there’s parts in the ending that just drag it out and they stuff with filler just to make it about an hour longer, or at least that’s how it felt to me because while the part I’m talking about loosely fit, it just didn’t make sense as to why. Like it was a sudden shift in tone and characters and it was minorly off-putting and I found myself staring at the screen quizzically wondering where this section came from. But I digress. Without going too into, the ending of this game is done pretty well, and the final cutscene… It’ll give you mixed feelings. CONCLUSION – At the end of the day a lot of this game is filler. I spent about 15 hours cluelessly flying from world to world only to actually having an engaging story start up at around 20 hours and then finally play something of quality almost 23 hours in. For about 5 hours. So the game can be beat in less than 30 hours. It’s still directed towards children and meant to be family friendly. Which is fine. But the average age group, or demographic, of the people playing this game on average are not the children you had back in 2002 when the first Kingdom Hearts released. I get it, it’s Disney. But you’d think the game would’ve grown up with us at least a little bit. All in all, this game is Kingdom Hearts 2.5. There was nothing Square Enix did to set this one apart from the other two games in the trilogy. Fantastic gameplay and pretty middling story. There’s effectively no story at all until the final couple hours, in which they wrap up nearly every single loose thread like they forgot homework was due that day. Overall fine enough and excited about where the series is going. Copyright © 2014 - 2019 SocksCap64, All Rights Reserved. Logos, Trademarks, Pictures Belongs To Their Respected Owners. Powered By WordPress. 118 Queries in 0.681 seconds.